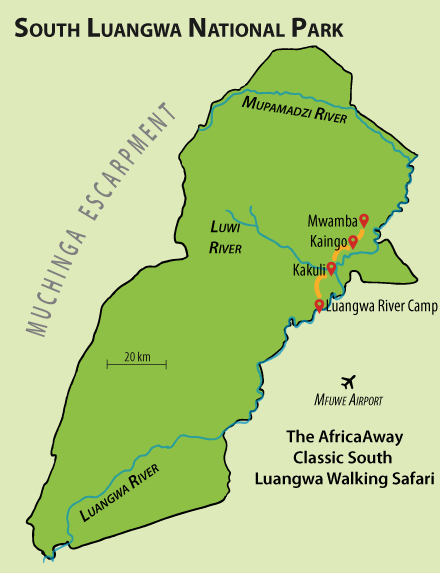 It can be seen from the map below that our Classic South Luangwa Walking Safari, although operating in the northern part of the Park where the other existing routes take place, actually takes a whole new direction, mainly paralleling the Luangwa River, through some of its most dramatic game viewing areas. It must be emphasised though that, although, we see the below as our optimum itinerary, everything is variable. Other camps may be chosen along the way (and may need to be if availability proves to be an issue), and the route can be extended or contracted at will to suit guests' personal preferences, budget and so on. The itinerary begins in the north, at the legendary Kaingo Camp, situated right on the banks of the Luangwa, located deep within the richest game viewing area of the South Luangwa National Park. Kaingo, and its associated Mwamba bush camp, are the creations of the Shenton family, which has a proud history of three generations of wildlife conservation in Southern Africa. In addition to some great game viewing, Kaingo provides a number of specially designed hides for viewing hippo and elephant, together with a Carmine Bee-eater Hide which is put in place early in September once the Carmines are established at their nesting site. 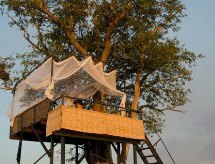 If you have the nerve it is also possible to experience a sleep-out at the elephant hide, high up above the ground. Your first three nights will be spent here at Kaingo enjoying the above facilities, essentially getting in some good game viewing prior to the serious walking to follow. You will also have the opportunity to begin to stretch your legs in the bush. Following this you will take your first significant camp-to-camp walk, heading out to their Mwamba bush camp, situated under huge evergreen ebony trees on the banks of the Mwamba River, a tributary of the Luangwa. Its four bungalows have large outdoors en suite bathrooms with flush toilets and hot bucket showers. Its lighting is all solar powered and the complete absence of generator noise means nothing interferes with the morning chorus - or the midnight howls of the hyena. Some excellent walking can be undertaken in this area, in addition to game viewing by vehicle, or spending time at the camp's Waterhole Hide. Indeed you might like to watch this 8 minute video that was shot here - it's one you will never forget! A large termite mound (opposite right) then provides an excellent location to enjoy a few rounds of sundowners. A particular experience never to be forgotten is to sleep out here on its elevated 'Numbu' platform. Even more so is a remote camp-out experience that is on offer here. On leaving Mwamba you will be driven a short distance to a point within which a good solid walk will take you to your next destination of Norman Carr Safari's Kakuli Bush Camp, already described elsewhere. You will spend two nights at Kakuli, either enjoying further walking, or game drives, or simply just relaxing in this beautiful location. 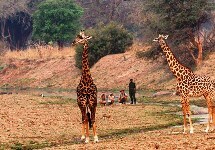 From Kakuli it is then a further demanding camp-to-camp walk, heading towards Luangwa River Camp, situated just outside the National Park, on the banks of the Luangwa River. Here you will be met within the national Park itself, and transported across the river to the lodge, either by vehicle or by boat, depending on the water level. 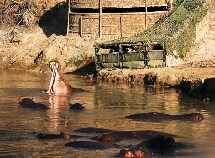 The unique construction of the lodge - described as 'Modern African Bush Chic' - was actually documented in the 2001 Channel 4 programme ‘No Going Back'. Nestled under an ancient ebony grove on the banks of the Luangwa River the lodge overlooks the Wafwa Oxbow Lagoon. This provides guests with game sightings directly from the lodge. 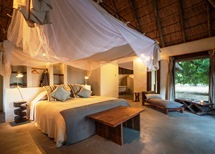 Its design and layout is simply stunning and is unlike anywhere else in the South Luangwa Valley. Using local materials and craftsmen, the lodge's overall theme is a fusion of traditional Zambian motifs mixed with North African (Moorish) design. Here you will spend a further two nights, in delightful luxury, again choosing between further walking and some excellent game drives, during which you will be able to stop off to pay your respects at Norman Carr's tranquilly located grave site on the banks of the river - a quite emotional and beautiful experience. A further option is to extend your trip still further by adding on our Secluded South Luangwa Walking Safari, beginning at Kafunta and then heading down to what are probably the two remotest bush camps in South Luangwa, where you will have the terrain entirely to yourselves. Essentially the choice is yours: all the elements described above can be modified to suit your own particular desires. We are confident, though, that, whatever you choose, you will experience what is probably the finest walking safari experience available in the whole of Africa. The cost, in high season, of staying three nights at Kaingo, two at Mwamba, two at Kakuli, and two at Luangwa River Camp (nine nights in total) is $7800. This is an example only: the actual trip could be longer or shorter.